Wall Street was hit hard last week with gloomy data that has kept buying interest stalled and investors spooked over a slow economic recovery. 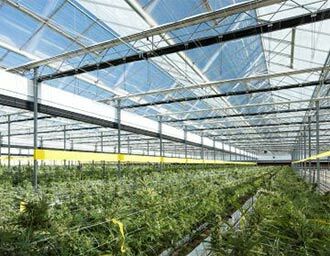 Stocks slipped over the past week after investors learned from government reports that jobs are getting scarcer than straw hats in a wind tunnel, and it isn't always sunny in Philadelphia. The big-cap indexes lost around 1%, while safe haven assets like gold and the U.S. dollar were buoyant. The best investment around for the week was the U.S. long bond, up 2%. 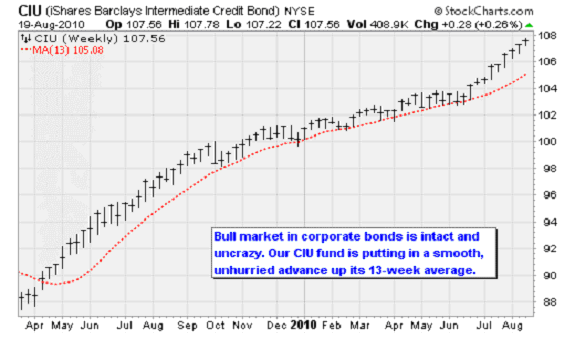 In this context, you really do have to pause to appreciate the bull market in corporate bonds, as shown above in the 18-month chart of our recommended iShares Barclays Intermediate Credit Bond Fund (NYSE: CIU). It's up about 28% in this span, including dividends, in a nice, smooth, easy-going lope. 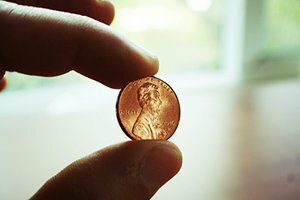 If you want to be positive about companies but don't want to own stocks, this is a great security to own — and it still offers a 4.4% annual yield, which is a lot more than you can say for money market funds and CDs. It was up 0.24% on Thursday as stocks were sinking 2%, a victory for the tortoises over the hares. The sell-off on Thursday was severe enough to classify as a 90% downside day, with down volume representing 92% of total volume on the New York Stock Exchange. The last similar episode was the 97% downside day on August 11. The fact the bulls couldn't mount a more significant charge in the wake of that wash-out is a negative signal that lower prices are still needed to encourage robust demand. But from an analytical standpoint, this conclusion is far from a slam dunk. According to the veteran volume analysts at Lowry Research, the losses last week were more the result of a withdrawal of buying interest rather than an increase in selling pressure. This continues a theme that's developed over the past few weeks: The decline was more about potential buyers being standoffish rather than about a mad rush by sellers to dump stocks. Of course there is always one buyer for each seller. The difference between rising and falling markets is that in bullish spans, shareholders try to hold onto their shares and bidders have to offer incrementally more to pry them loose. In bearish spans, it's holders that are more aggressive as they try to get rid of their shares and have to accept incrementally less to entice buyers. In the current case, a relatively small number of shareholders are trying to sell and, meeting with indifference from buyers, they're forced to offer a bit less. The reason we make this distinction is that it often doesn't take much to turn this sort of aloofness around. As long as holders aren't outright throwing their shares on the market, the psychology of a week like this can reverse relatively quickly when buyers suddenly find their appetites whetted by lower prices. So with much of Wall Street out on vacation, who's been doing all the buying? New evidence suggests corporate insiders are one big group. According to InsiderScore.com, net buying by insiders has increased to the highest levels seen since March 2009 when stocks were first finding their footing after a two-year meltdown. So this is good news, especially with stocks still off their July lows. 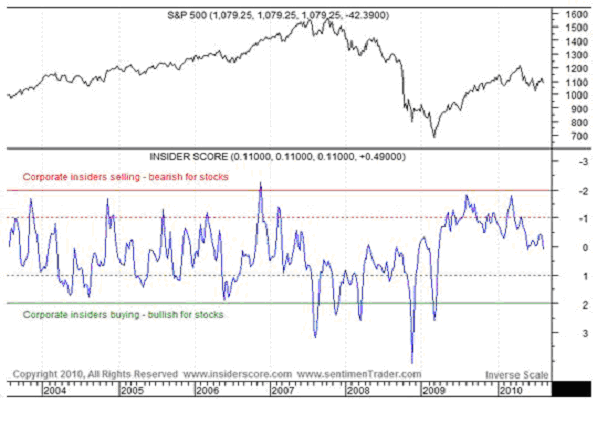 Yet as shown in the chart above, insider buying is nowhere near the extremes reached back late 2008 or early 2009. 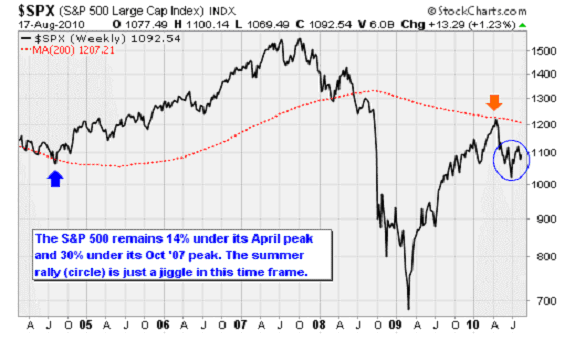 And if you look closely insiders were also buying avidly in late 2007 and early 2008 just ahead of disaster. But still, this factor brightens what is otherwise a rather dark picture. With stocks apparently trapped in a trading range and with breadth data sending mixed signals, I think the CBOE Volatility Index (VIX) can provide us with a few clues into where prices are heading. The VIX, or fear gauge, moved up through its 50-day moving average this week for the first time since late June. Significant market declines have been associated with VIX reading above the 50-day average. If we see volatility expectations continue to rise, then it'll be time to prepare for a return to the July lows or worse. Investors were spooked on Thursday by some negative news on the jobs and industrial production fronts that provided insight into the slowdown of the U.S. economy's recovery. Initial weekly jobless claims jumped by 16,000 to cross back over the 500,000 barrier, as shown below. To see jobless claims rise to the highest level in nine months this far into the recovery should have been downright embarrassing for Washington policymakers, who have spent an absolute fortune on trying to boost employment. The four-week average moved to 482,500, the highest since December. Separately, the Philadelphia Fed Survey indicated that manufacturing activity in the mid-Atlantic region actually slowed in August from July. The index fell to -7.7, well under the consensus estimate of +7 and the period month result of +5.1. New orders fell to -7.1, the second consecutive monthly decline. Weakness was seen throughout the survey: Unfilled orders fell, shipments fell, the workweek fell, inventories fell, and employment fell. To recap the results, let's turn to Capital Economic senior economist Paul Ashworth. In a note to clients last week, his assessment was clear: "Today's news on the U.S. economy has been nothing but awful." The economy is slowing dangerously close to its stall speed — represented by year-over-year gross domestic product (GDP) growth of less than 2%. Overall, bulls have got to be disappointed. It's hard to believe that this is happening just a year after the government launched $750 billion in fiscal stimulus across the country and set interest rates at a 300-year low. If you pan back and look at the big picture, in the chart above, you can see the summer rally is still just a wiggle in a big downtrend. Nothing exciting really happens until bulls can find the energy to pop over the 100-week average of the S&P 500, at around 1,130, and stay there for a week, and everything under 1,200 is just fidgeting as well. The bottom line is that the job recovery is slowing, and the August payroll numbers, when reported on Sept. 3, might well get the post-summer market into a grumpy mood. Ultimately the sun will shine again and people will want to hold onto tech, industrial and retail stocks for longer than a few days. But for now the psychology is shifting lower, and it's happening right on schedule. More insight into the thinking of Wall Street professionals comes courtesy of the latest Merrill Lynch Fund Manager Survey for August. The survey shows only 5% of respondents predict that the global economy will improve in the next year. While 78% of respondents said they think a new recession is unlikely, 73% think below-trend growth lies ahead. Around 14% of asset allocators believe that global monetary policy is too stimulative, compared to just 5% in July. The Merrill Lynch team also asked fund managers where they think the economy is in the business cycle. Options included recession, early cycle recovery, mid cycle, and late cycle. The majority believe we are in the first half of the mid cycle, which would be pretty far along. As for sector positioning, a majority are overweight technology on expectations of an increase in capital investment by businesses. This is followed by overweight positions in industrials, pharmaceuticals, energy, and consumer staples. Consumer discretionary stocks are seen as the more overvalued sector while pharmaceuticals are seen as the most undervalued. I found these results a little odd since most big-cap tech stocks are dead in the water at present. Intel Corp. (Nasdaq: INTC), Dell Inc. (Nasdaq: DELL), Oracle Corp. (Nasdaq: ORCL), Microsoft Corp. (Nasdaq: MSFT) and Google Inc. (Nasdaq: GOOG) are all trading sideways or down since making highs in January or April, and have barely budged in the past few weeks when other stocks have rallied. 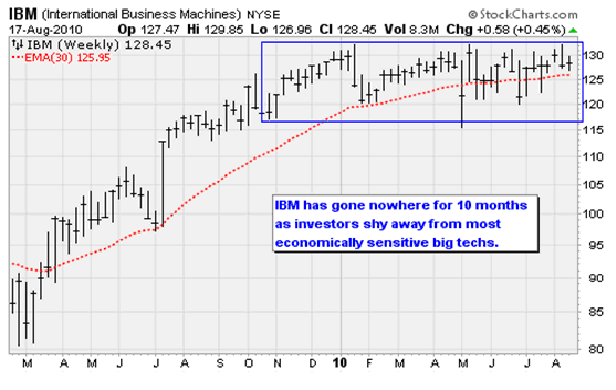 As you can see in the chart above, these fund managers must be doing a very stealthy job of accumulating tech when you consider that long-time darling IBM Corp. (NYSE: IBM), above, has lain flat for ten months. Perhaps they are pecking at the IBMs and Oracles while adding to drugs and staples with more gusto. The contrarian in me wants to fade the 73% who are looking for below-trend growth, but I actually think that they are right. Starting in the fall, year-over-year comparisons will get a lot stiffer for the economy overall and corporate earnings specifically because of the improvements seen in late 2009. Less impressive growth comparisons may well spook investors, leading them to "re-rate" equities downward, in the parlance of analysts, by offering lower price/earnings multiples. When you see big gains in earnings at INTC and IBM resulting in no advance in the shares, that is what is already occurring. If the trend continues, it's going to be a very bumpy fourth quarter. You may have noticed that the correlation between developed country fixed income markets has increased dramatically over the past couple of weeks. During late June and July, Goldman Sachs Group Inc (NYSE: GS) data showed that U.S., the Eurozone, U.K., Japanese, Australian, and Canadian bond markets were exceptionally uncorrelated, with each responding to divergent catalysts. But in recent weeks, these major bond markets have "recoupled," and all are showing a powerful upward trend, especially in contrast to stocks. Goldman observes furthermore that the bond market overall has been increasingly more detached and uncorrelated from other major asset classes, such as stocks and currencies, so U.S. fixed-income investors should solely focus on other global fixed income markets right now for directional clues. Fixed-income traders at the brokerage believe that the de-correlation of U.S. fixed income from other assets while it's rolling higher in a strong trend indicates the resiliency of the bond bull market. This re-coupled global bond market may reflect a belief that most major central banks have returned to the fully accommodative, or looser, end of their interest-rate spectrums. And that could be the reason that gold has rallied recently, and could become a very popular long again. Through the end of July, gold had been trading more like other commodities than as a safe haven — but now in August that dynamic is changing. This bodes well for the Market Vectors Gold Miners ETF (NYSE: GDX), which was up 3.5% in the past three weeks while the broad U.S. was down 4%. Keep holding gold and gold miner stocks. To end a brighter note, we did get a positive sign though on Monday that the Fed's efforts are beginning to clear the logjam that has limited the creation of new loans: For the first since 2006, a majority of senior loan officers indicated that lending standards for small businesses eased. Demand for new business loans also increased slightly. What's driving the change? A combination of competition from other banks (all armed with cheap money to lend) along with the improving health of the nation's businesses thanks to deep cost cutting and a rebound in economic activity. Also, the survey indicated that banks eased their standards and terms on almost all categories of loans to households. An easing of credit standards and an increase in loan growth is exactly what's needed to boost what's known as the velocity of money and kick the economic recovery back into gear. Think of it this way: As banks increase their lending, it's as if the Fed has increased the money supply and lowered interest rates. The effect on the economy is the same. And it's a big positive, at least for the first couple of years — before too much of a good thing leads to inevitable extremes and bad behavior. Monday: The Empire State Manufacturing Survey posted a smaller than expected increase for the month of August. The index increased to 7.1 from 5.1 previously, which was under the consensus estimate of 8. Despite the increase in the overall index, the underlying data suggests the economy continues to flounder. There was month-to-month deterioration in new orders, unfilled orders, and shipments. Tuesday: Industrial production, which faltered in June, bounced back in July. Overall production increased 1% for the month, beating the consensus estimate of 0.6%. Manufacturing led the way higher, posting a 1.1% increase thanks to an increase in motor vehicle production. By market group, business equipment jumped 1.8% — another sign that the economic recovery is being driven by business investment and capital expenditures. Wednesday: Mortgage Bankers Association Purchase Applications Indices showed recovery low mortgage rates have resulted in a burst of refinancing activity. The Refinance Index jumped 17.1% from the previous week. By refinancing at lower rates, consumers are reducing their debt servicing costs. This lessens the burden from household debt loads and unlocks purchasing power — all of which will provide a boost to .the economy. Thursday: Investors were spooked on Thursday by some negative news on the jobs and industrial production fronts that provided insight into the slowdown of the U.S. economy's recovery. 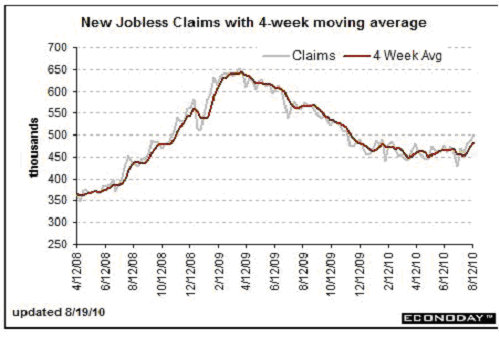 Initial weekly jobless claims jumped by 16,000 to cross back over the 500,000 barrier, as shown below. To see jobless claims rise to the highest level in nine months this far into the recovery should have been downright embarrassing for Washington policymakers, who have spent an absolute fortune on trying to boost employment. The four-week average moved to 482,500, the highest since December. To recap the results, let's turn to Capital Economic senior economist Paul Ashworth. In a note to clients today, his assessment was clear: "Today's news on the U.S. economy has been nothing but awful." Monday: The Chicago Fed National Activity Index will be released. Earnings: Yanzhou Coal Mining Co. (NYSE ADR: YZC); ABM Industries, Inc. (NYSE: ABM); LaBarge, Inc. (AMEX: LB). Tuesday: Existing home sales for July will be reported. Sales came in at a 5.4 million seasonally adjusted annual rate in June. Analysts expect a decline to a 4.7 million annual rate. Earnings: Big Lots, Inc. (NYSE: BIG); Burger King Holdings, Inc. (NYSE: BKC). Wednesday: New home sales and durable goods orders will be reported. Earnings: American Eagle Outfitters (NYSE: AEO); Aluminum Corp. of China Ltd. (NYSE ADR: ACH); BHP Billiton Ltd. (NYSE ADR: BHP); Brown Shoe Company, Inc. (NYSE: BWS); Guess?, Inc. (NYSE: GES). Thursday: The release of initial weekly jobless claims will be closely watched following last week's increase. Earnings: Ship Finance Intl Ltd. (NYSE: SFL); OmniVision Technologies, Inc. (Nasdaq: OVTI); J Crew Group, Inc. (NYSE: JCG). Friday: The government will likely downwardly revise its Q2 GDP growth figures to 1.3% from the previously reported 2.4% increase as exports have weakened more than expected. Currency movements were largely to blame as the European debt crisis resulted in euro depreciation — boosting the competitiveness of European exporters. Earnings: Tiffany & Co. (NYSE: TIF); VimpelCom Ltd. (NYSE: VIP); Frontline Ltd. (NYSE: FRO). Will the Fed Opt For More Stimulus as the Economic Recovery Founders? Excellent commentary and analysis…the best I've seen.